I started to entitle this post, “Da Bomb Diggity Protein Conditioner.” Then, I figured I needed to show a little more tact. I almost couldn’t help it though. I am from New York and we say things like “Da Bomb” all the time. Well, at least we used to when I was growing up LOL. The “diggity” was for extra added enthusiasm. Anyway, I am too excited about a new protein conditioner I bought. After using it, I was amazed at the fast results. Not only was my hair instantly stronger with virtually no breakage after using it. It was also left pH balanced! How do I know? Because of the way my hair curled right up! I’ve always struggled with straight ends. After reading some things about the hair’s pH balance (plus watching this video), I’m convinced that an off-balance pH balance may be the biggest culprit of my straight ends. I try so many products at times (the PJ in me), that it’s highly probable that many of them have messed with my hair’s pH balance. Hmmm, time to tame the PJism. So What Is This New Protein Conditioner? 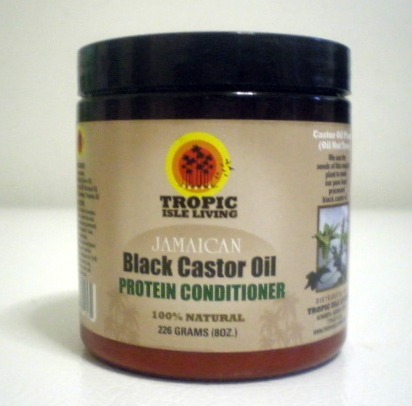 It is Tropic Isle Living Jamaican Black Castor Oil Protein Conditioner (you can find it here ). I’m telling you, this stuff is absolutely amazing. I love how my hair felt after applying it, treating it with heat and then rinsing it out. Strong and easy to detangle after applying diluted Herbal Essences Hello Hydration. All natural. Double score. The only thing is it smells like pickles. I can deal with it though because the results were so awesome. One thing I know is fine hair likes protein. However, it needs moisture to balance out the protein. Having fine strands of natural hair that’s not abused with heat or chemicals don’t require protein treatments on a weekly basis. Bi-weekly protein treatments are however, beneficial for fine hair. This new JBCO protein conditioner has changed my life (OK that’s a little extreme but you get the picture). This is a new staple for me and is being incorporated into my hair care regimen. It’s changed everything and comes at a good time now that we are entering the colder months when hair needs added protection. Pre-poo hair with Vatika and Jamaican Black Castor Oil (JBCO) the night before washing. Leave in hair overnight. Loosen the twists and deep condition with either the JBCO protein conditioner or Shea Moisture Hair Mask with honey added. I’ll be alternating these every other week so I don’t over-protein treat. Apply Kimmaytube Leave In Conditioner and seal with JBCO. 2018 UPDATE: While my techniques have not much changed, my products have.. Subscribe to this blog for updates. 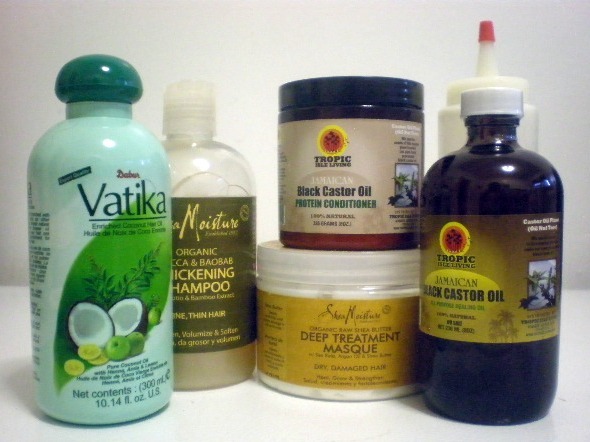 What’s your hair care regimen like? Please share by leaving a reply below. Ahh ponytails. Depending on what are you using to do them, that could cause breakage too. Satin scrunchies are the kindest for ponytails. Banana clips are also pretty good. Just be careful not to put them too tight. If you use elastic bands, the ones I recommend are the Goodie Ouchless elastic bands. Those won’t rip at the hair as much but you shouldn’t use them too often either. last, to do your ponytails, also add a little lieave in and moisturizer to your hair to protect it from the stress of pulling at the hair. Hello Michelle =0) I have read about Jamaican black castor before but after reading your blog here I am convinced I would like to try it for myself and my 12 year old daughters hair but I would also like to know is it safe to use on my 1 year old daughters hair because I use baby oil and petroleum jelly on her hair but I’ve read that this isn’t good for the hair, any suggestions on whats safe to use on her hair? You absolutely CAN use the JBCO on your little one’s hair. It’s an all natural oil. I’d just do a small area just to make sure she doesn’t have any allergies to it. Even natural products can cause some reactions if one is allergic. However, I don’t think you’ll have a problem at all. My mom also uses JBCO on her hair to thicken it at the root. She had some thinning due to brain surgery and her is starting to fill in now and all she uses is the JBCO massaged into her scalp a few times a week. Oh yes… and I just rewatched that pH video also. Isn’t it interesting… and true? LOL that’s right. Tame that PJism! I just bought the book about the tightly curly method for my kindle. I’m going to try and do her way of leaving regular conditioner in my hair not deep conditioning and see if I make any progress. If it works and I notice my hair growing and no breakage, I may not replenish my supply of products. We’ll see. I heard it works well, but I know my hair will never dry with conditioner in it. That’s the only reason I’ve never tried it. It’s similar to the method they use at the DevaChan Salons (with DevaCare/DevaCurl) from what I’ve heard. Keep us posted. Well so far it’s been hours and while my hair is dry on the ends, the roots are still sopping wet. I don’t like this. I think I’m just going to do my protective styles and bun it. Will probably give it once more chance though because I think I OD’d on conditioner this first time LOL. I’m also not a fan of brushing my hair so I don’t know about the Denman. Do you use it? I was wondering how this conditioner was. I’m glad you like and it worked for you. Now, I might just give this a try. I don’t pre-poo, but I will be incorporating it in my regimen. So I appreciate you sharing your hair care regiment. It lets me know that I’m on the right track. Hey Evelyn. I’m quite surprised that this joker was effective as it was. If your hair is protein sensitive though, you may want to leave it alone. It’s a strong protein conditioner but once you rinse it out with a moisturizing conditioner, your hair should be nice and pliable. I really recommend Hello Hydration. It has a lot of slip making detangling easier. I’m glad someone tried this out. I was eyeballing this for the longest time. I am ordering this right away, I hope it works for the minor breakage that I have. Thanks for the review. Miche’al I really think it will. It was very effective. Remember, I was saying how I was having this breakage and stuff? I think it worked well combined with the other products. It does stink though but to me it’s tolerable. it’s natural which I love. Just make sure to use your Aussie Moist or Hello Hydration right afterwards. Protein does make the hair a little hard but you can soften it right away with the rinse out moisturizing conditioners. Hello My Name is Etoile and I am a PJ!! Girl I am ordering that this eve when I get home to my computer. So do tell…how are you liking the SheaMoisture Shampoo? The Organic Raw She Butter left my hair feeling like straw, I love the brand and wish I could find a product from their line that works for my hair. LOL. I love that it stopped my breakage. Even better than the Aphogee. I’ll give you the same advice as Micha’el though. Make sure you follow with a moisturizing conditioner. That is the key. Protein will make your hair hard but that’s what it’s supposed to do. You just gotta soften it up! 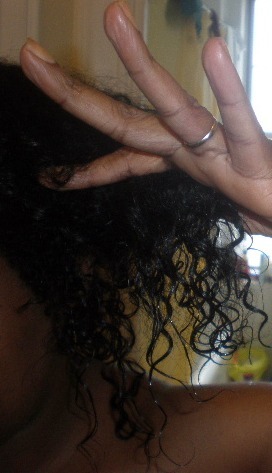 I really like the SM Organic Yucca & Baobab thickening shampoo. It doesn’t leave my hair like straw. I’m definitely buying this again. Wow, you have such an incredible hair regiment!! Mine is nothing compared. Because my hair is so oily (I HAVE to wash it every day, otherwise…gross)….it’s basically wash with clarifying shampoo, and brush after the shower. That’s pretty much it, unless I want it to be icky. Thanks Kirstin! i have dry hair if I don’t take care of it. I’m sure if I had oily hair I’d wash it more often too 🙂 No brushes on my curly hair thought!